Born in Dayton, OH, the birthplace and home of the Wright Brothers, it seemed pre-determined that Tom Crouch would be a curator of history and education of flight and aviation. Beginning in 1998, Crouch has served as the Senior Curator of the Division of Aeronautics at the National Air and Space Museum. A Smithsonian employee since 1974, he has served both the National Air and Space Museum (NASM) and the National Museum of American History (NMAH) in curatorial and administrative posts. Prior to coming to the Smithsonian he was employed by the Ohio Historical Society as director of education (1969-1973) and subsequently as the Director of the Ohio American Revolution Bicentennial Advisory Commission (1973-1974). Crouch holds several degrees in history: BA, Ohio University; MA, Miami University, and a Ph.D, Ohio State University. Additionally, he holds an honorary degree of Doctor of Humane Letters conferred by the Wright State University. He is the author or editor of more than 18 books and over 100 articles for both popular magazines and scholarly journals. Most of his work has been on aspects of the history of flight and flight technology. Crouch has won a number of major writing awards including: the history book prizes offered by both the American Institute of Aeronautics and Astronautics and the Aviation/Space Writers Association; the Christopher Award (1989), a literary prize recognizing ” significant artistic achievement in support of the highest values of the human spirit,” for The Bishop’s Boys: A Life of Wilbur and Orville Wright; the Gardner-Lasser Literature Prize, 2005; and the AIAA for Wings: A History of Aviation From Kites to the Space Age. Crouch is in high demand for speaking engagements and is an AIAA Distinguished Lecturer. 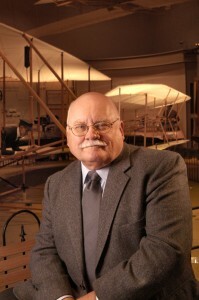 Throughout his career, Dr. Crouch has played a major role in planning museum exhibitions, the Neil Armstrong Museum, Wapakoneta, Ohio; the Ohio Historical Center, Columbus, Ohio; the National Air and Space Museum; the National Museum of American History; and the Stephen F. Udvar-Hazy Center of the National Air and Space Museum. In the fall of 2000, President Clinton appointed Dr. Crouch to the Chairmanship of the First Flight Centennial Federal Advisory Board, an organization created to advise the Centennial of Flight Commission on activities planned to commemorate the 100th anniversary of powered flight. Crouch has been married to the former Nancy Anne Gochenouer for more than forty years. They are the parents of three grown children and the grandparents of Emma and Alex.